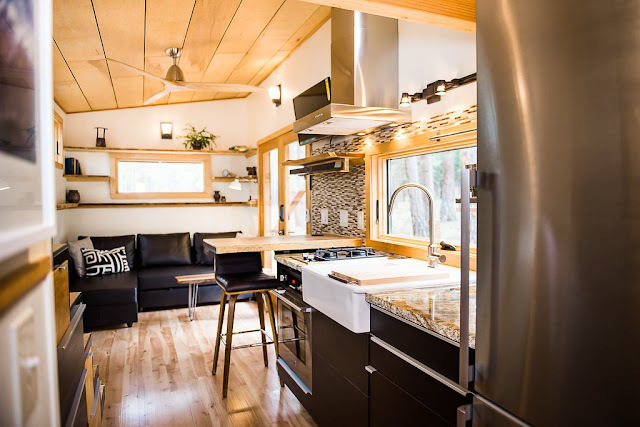 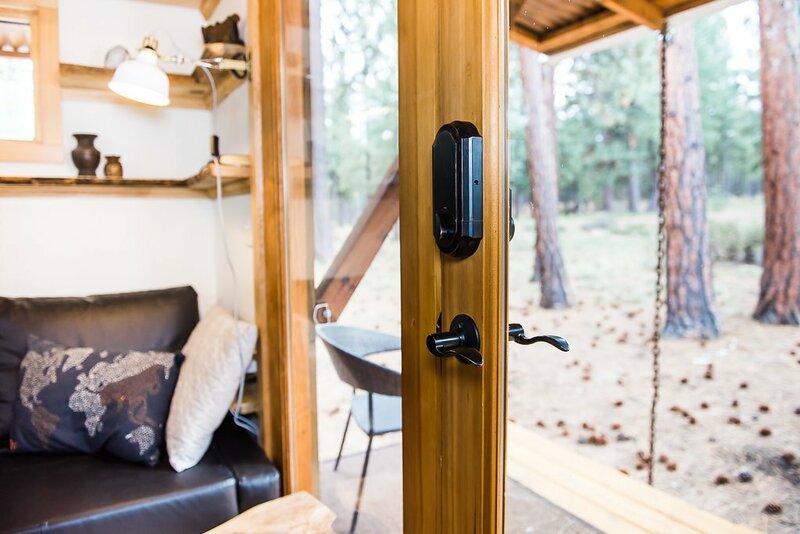 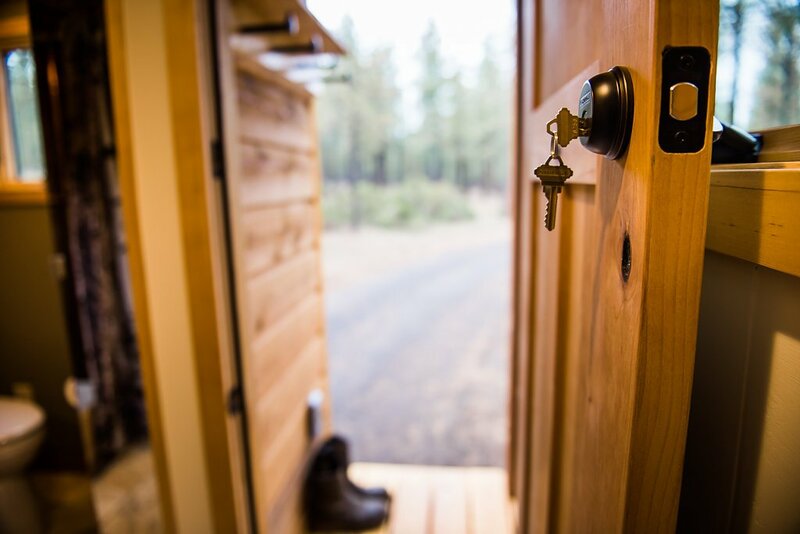 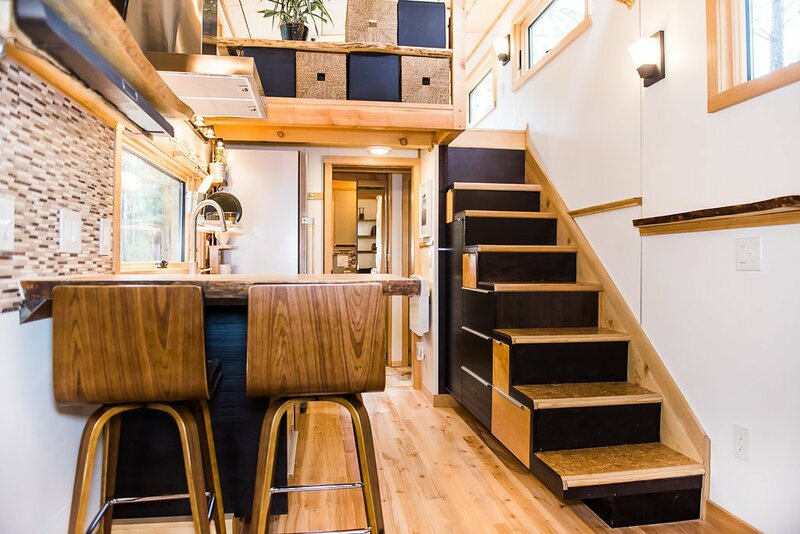 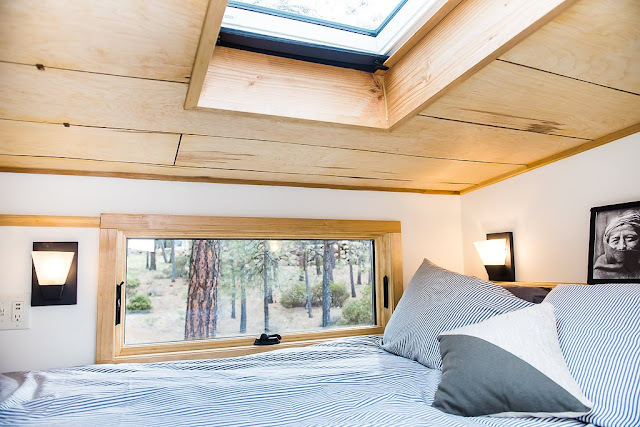 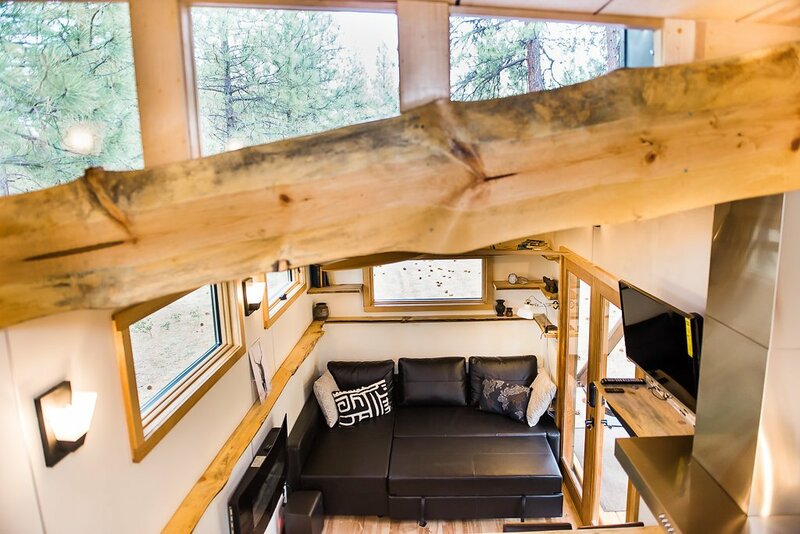 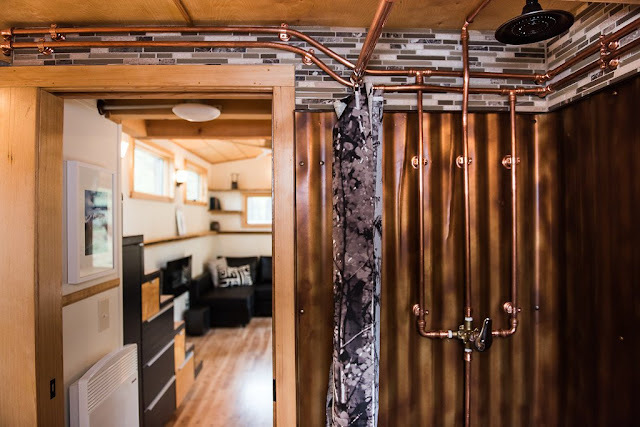 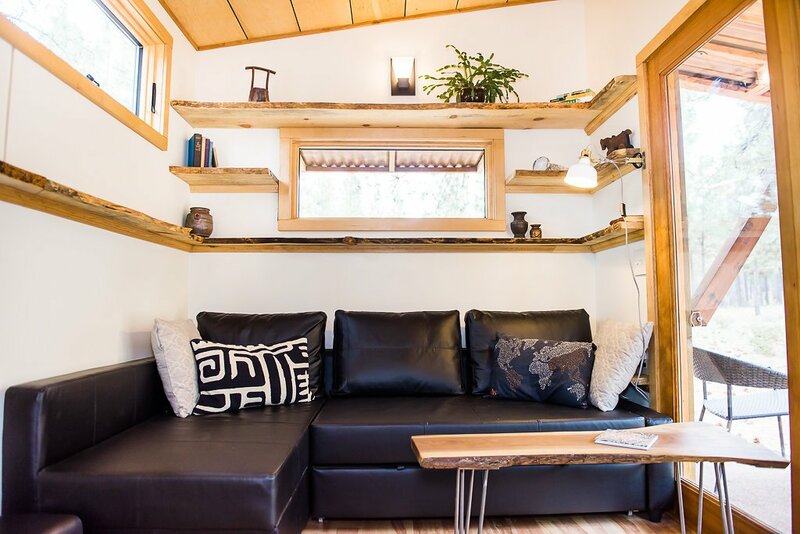 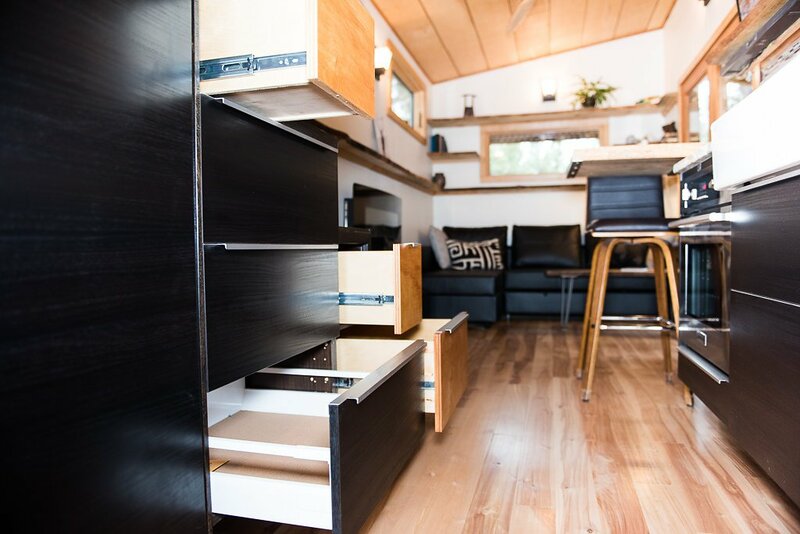 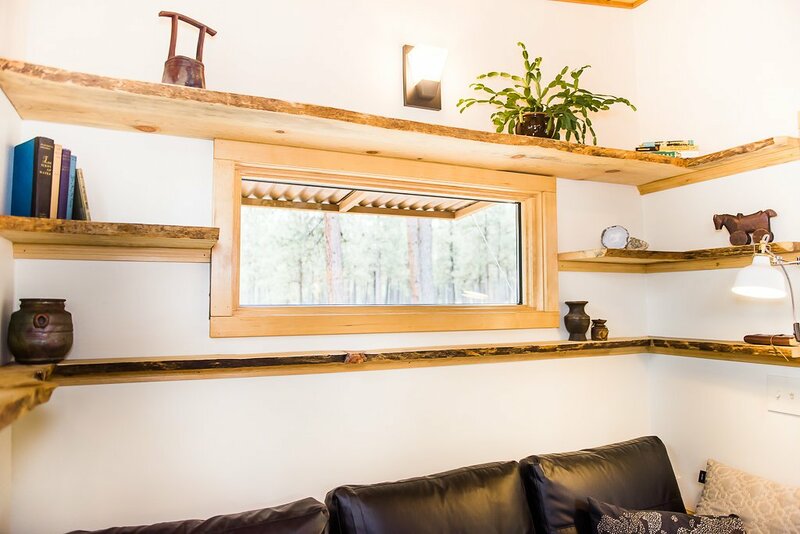 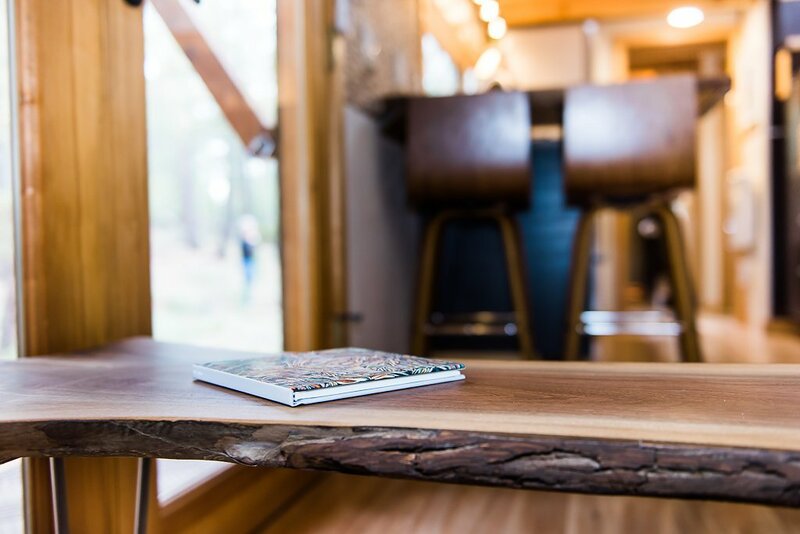 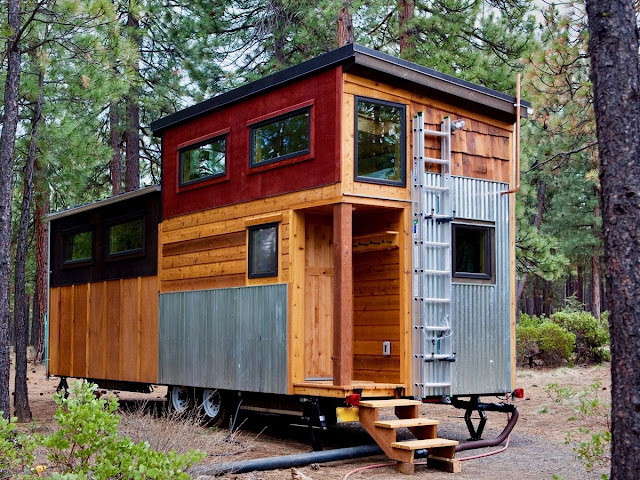 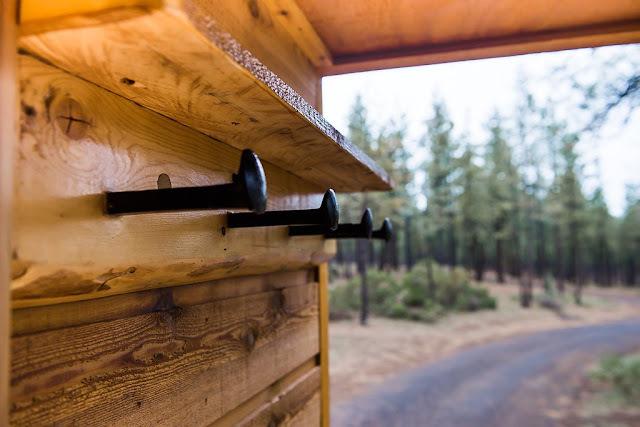 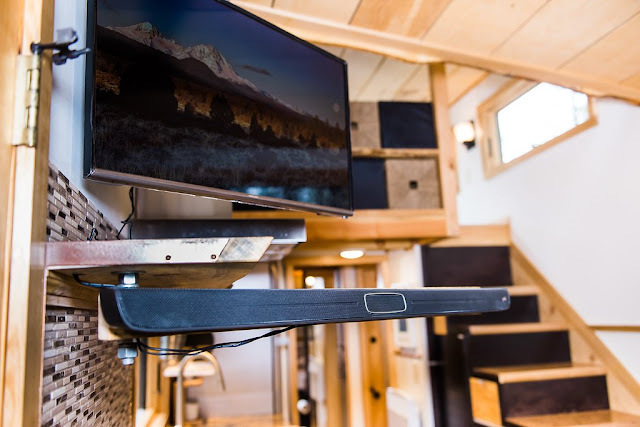 Wood Iron Tiny Homes is a tiny house building/designing company located in Sisters, Oregon. 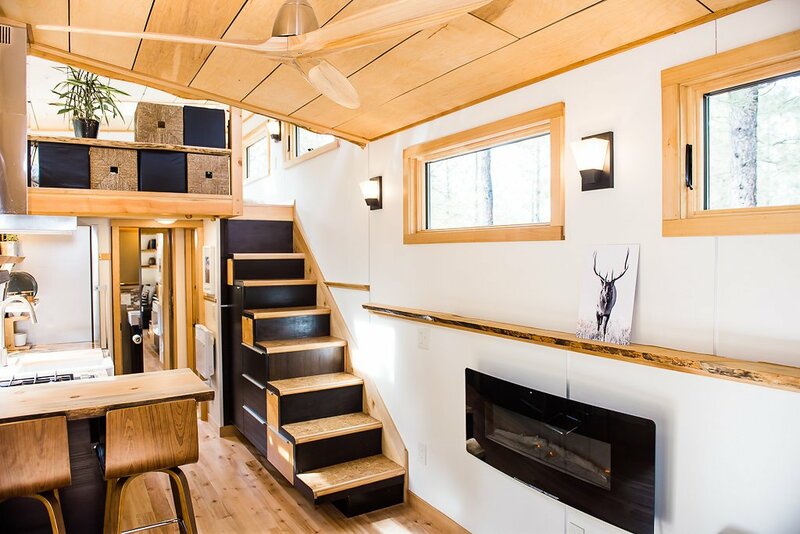 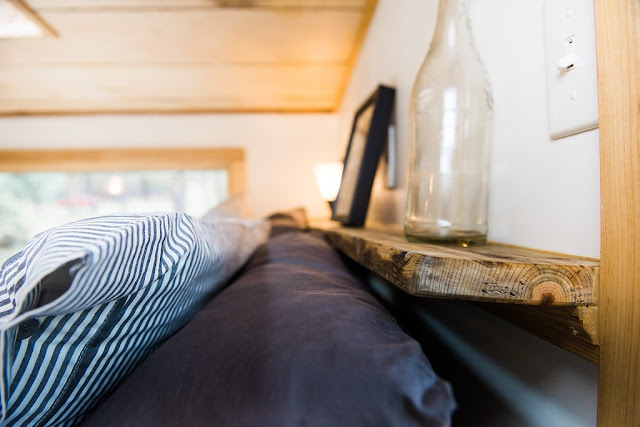 They aim to create simple, quality tiny homes; and, their first tiny home for sale is a great example of their work and mission. 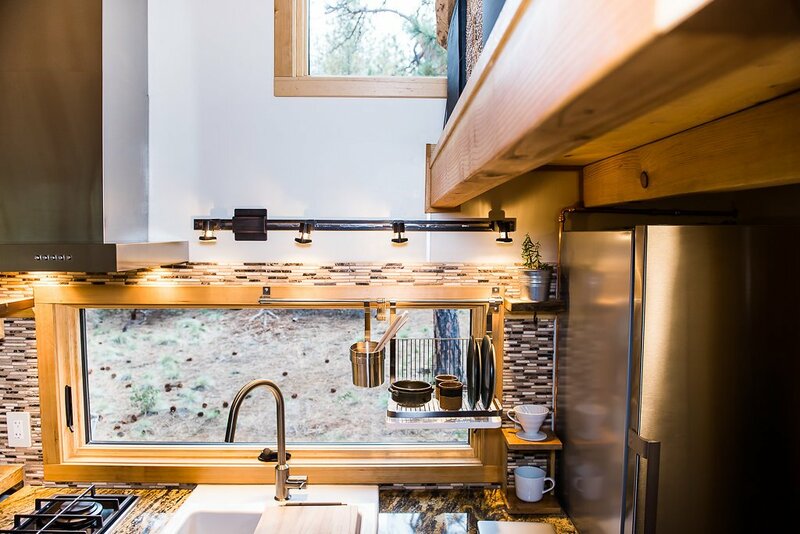 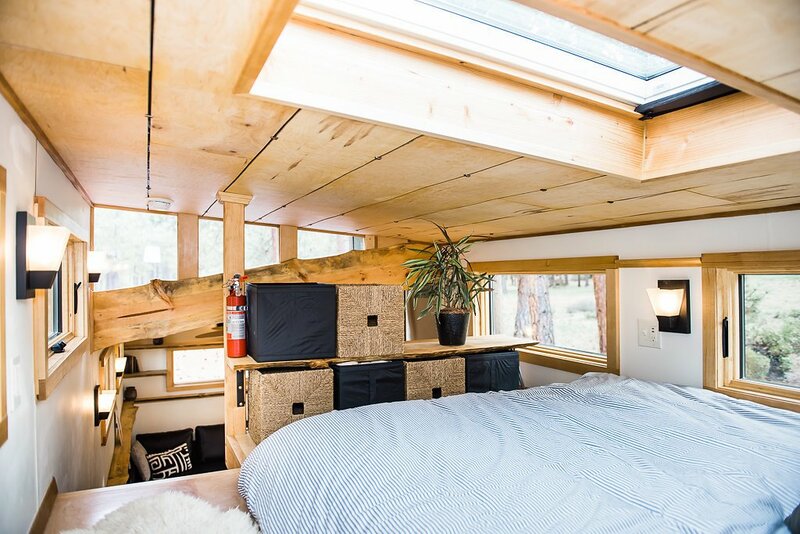 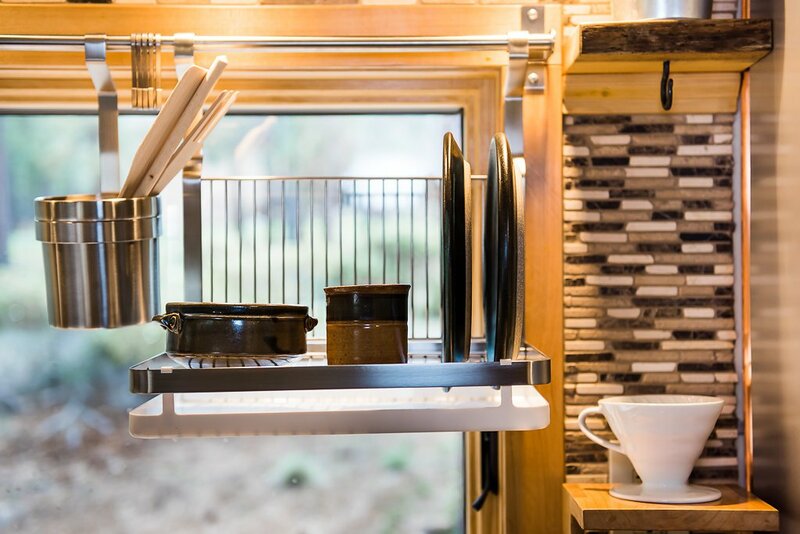 This tiny home was not only built to be durable on the inside but on the outside as well. 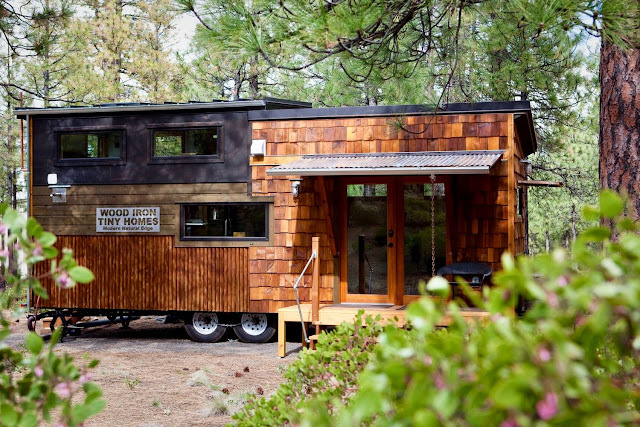 The siding of the home is built to be energy efficient while withstanding the elements. Also, a large awning covers the 5’ x 10’ porch to protect it from the elements. Entering through the glass French doors of the home, you will find yourself in the living area. 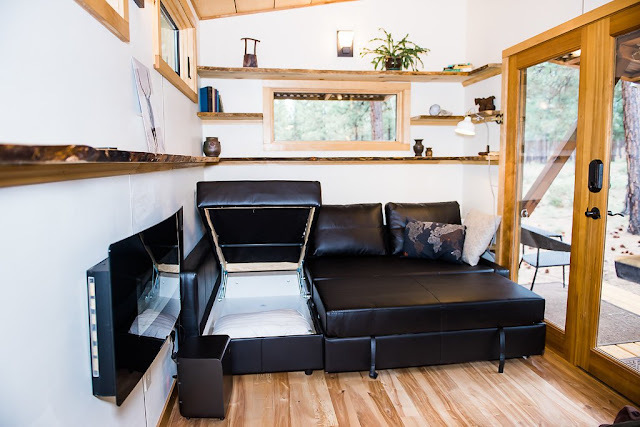 This space features a modern ceiling fan, electric fireplace and black sectional sofa that can be converted into a queen-sized bed. Facing away from the living room, you will see the staircase that leads up to the lofted bedroom on the right, and the kitchen on the left. 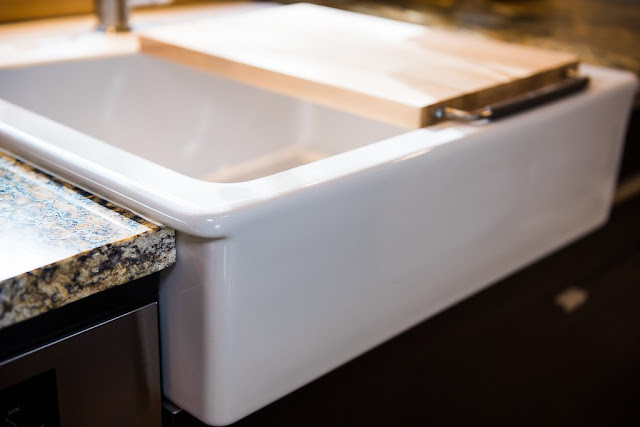 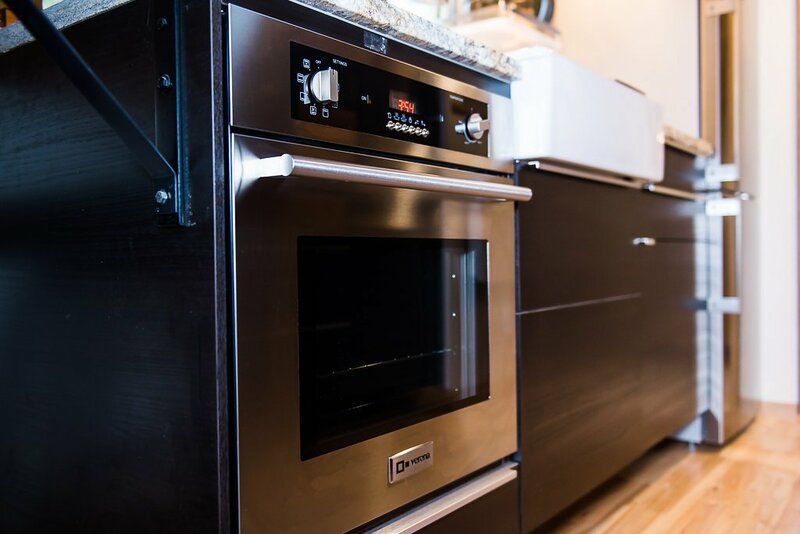 The kitchen is the epitome of luxury with its Italian stainless steel appliances, granite countertops, and mosaic backsplash. 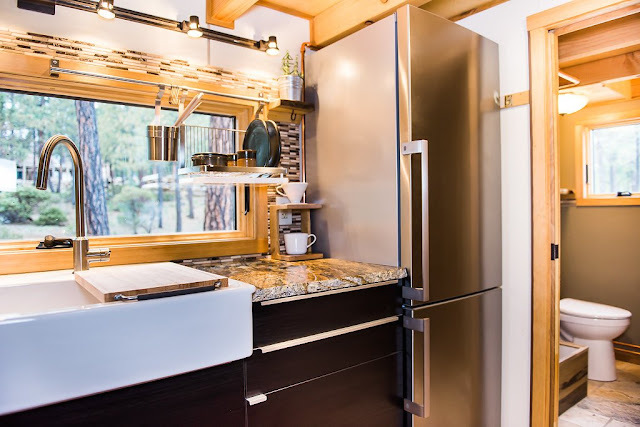 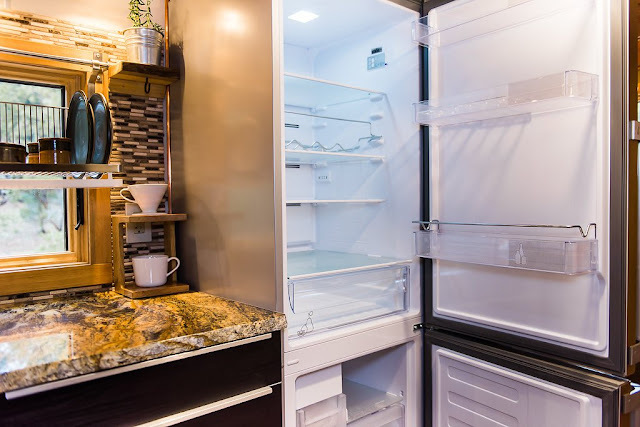 It features a large fridge/freezer, farmhouse sink, 2-burner gas cooktop, oven and dining bar with bar stools underneath. If you walk past the kitchen to the far left of the house, you will end up in the bathroom. 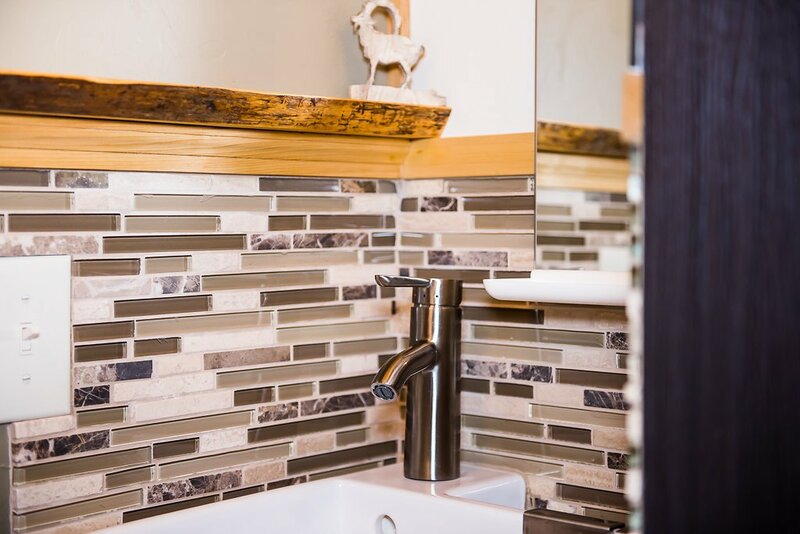 This bathroom features a standard toilet, porcelain sink, rain shower, tub and stacked washer/dryer unit. 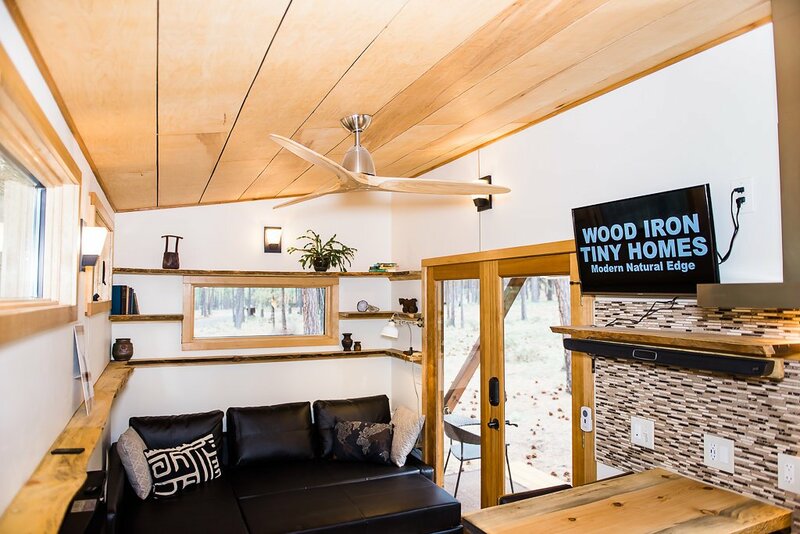 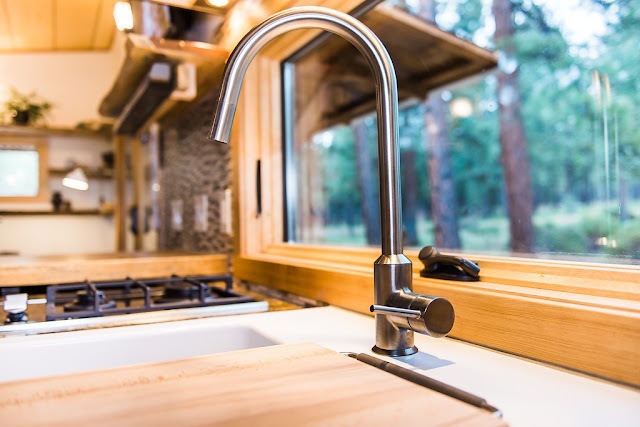 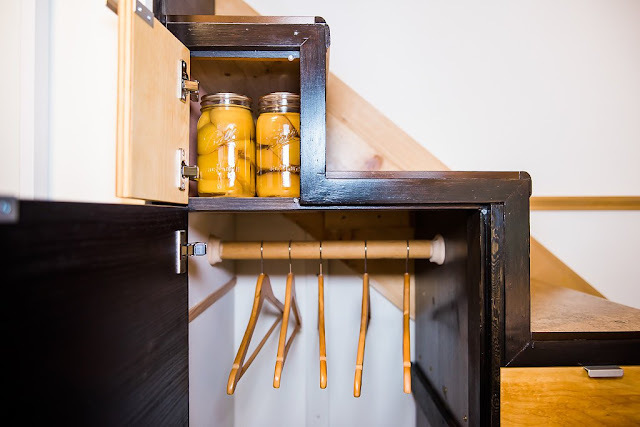 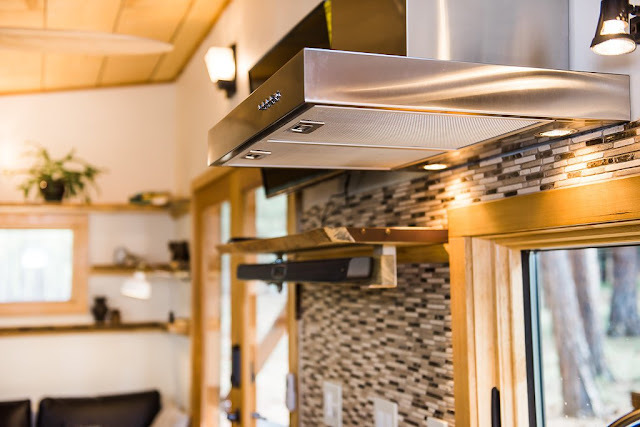 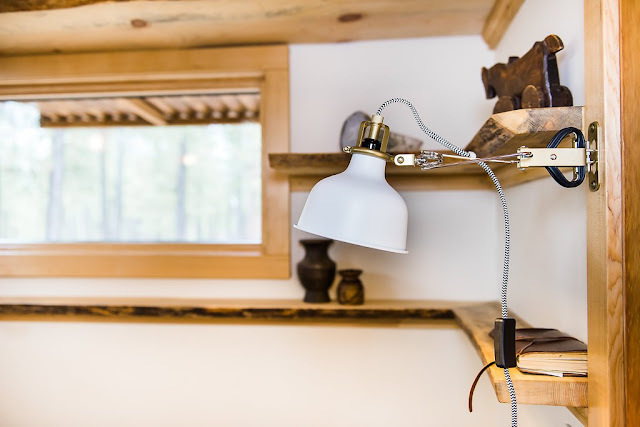 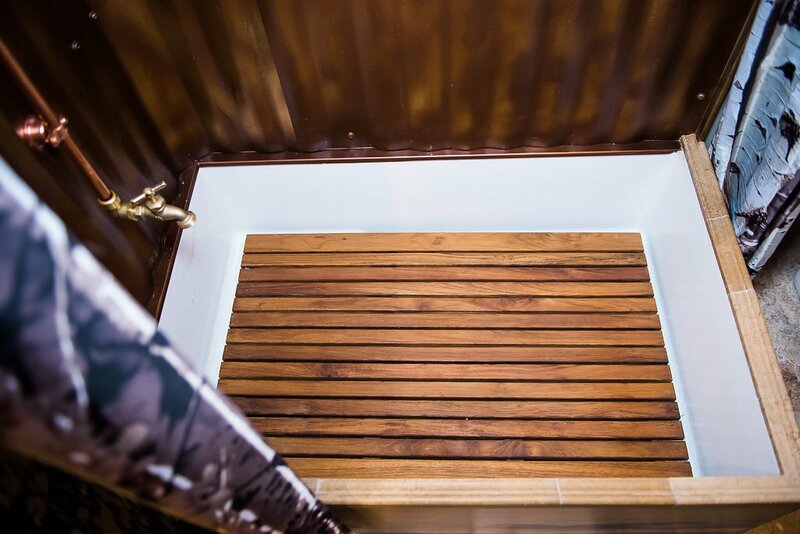 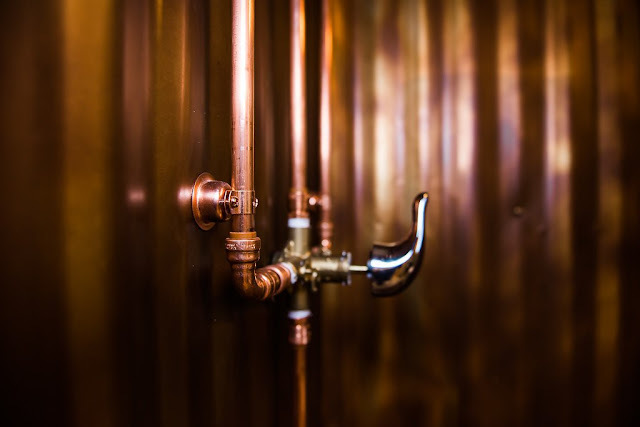 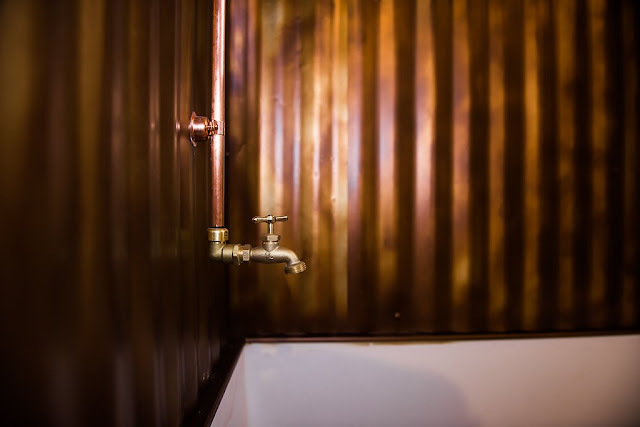 For more information on the Wood Iron Tiny Home company and this home, visit their website here!